A farmworker advocacy group and the agency that regulates pesticide use in Monterey County TODAY announced the establishment of a farmworker advisory committee to advise the agency and to connect field workers to resources that the agency can use to help them. 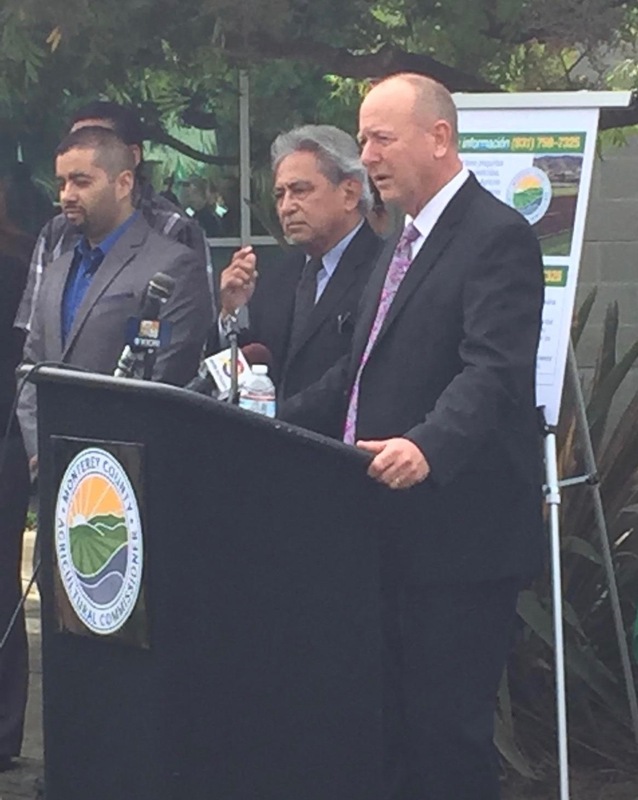 “The advisory committee gives us direct access to farmworker leaders; to their concerns and to their suggestions,” said Eric Lauritzen, the Agricultural Commissioner of the County of Monterey. Farmworker leaders trained by the Center for Community Advocacy (CCA) will compose the advisory committee. Six of these CCA-trained neighborhood leaders will comprise the advisory committee. The Committee will advise the Commissioner’s Office on policies and practices as they impact field workers in Monterey County. The advisory committee and the Agricultural Commissioner’s Office will strive to improve protocols that protect farmworkers from pesticide exposure and other protocols within the Commissioner’s jurisdiction that protect the health and safety of farmworkers. The partnership will also help disseminate information about resources and programs that the Commissioner’s Office can make available to the farmworker community. 1. To meet at regular intervals with the Commissioner and his/her staff to exchange information and ideas that will improve the safety of farmworkers. 3. To host annual community dialogues where farmworkers and the Commissioner’s Office meet to discuss the Commissioner’s jurisdiction over agricultural lands in Monterey County. 4. To promote a more sustainable agricultural economy in Monterey County by protecting its most critical resource: farmworkers. Discussions about forming the committee began several years ago. Working through a rocky start, both the Commissioner’s Office and CCA saw the incredible potential in developing a working relationship. The two agencies had never worked together. Each had questions about the other’s willingness to work cooperatively. The two agencies developed their relationship by working together on several projects including the AgKnowledge Program hosted by the Grower-Shipper Foundation and a series of small forums between the Commissioner’s Office and CCA-trained leaders. Now, both the Agricultural Commissioner’s office and CCA look forward to this joint effort.